Is there any more you can do on your own website to help increase awareness of gift experiences and make the buying experience more relevant for people, as well as improving conversion and sales? Deep links (sometimes known as direct links) is the use of a hyperlink that links to a specific, generally searchable piece of web content on a website, i.e. rather than the link just taking the user to the website’s home page i.e. Deep links take users to a relevant piece of content directly and can be used to guide people to a certain page, without disrupting their ‘journey’. 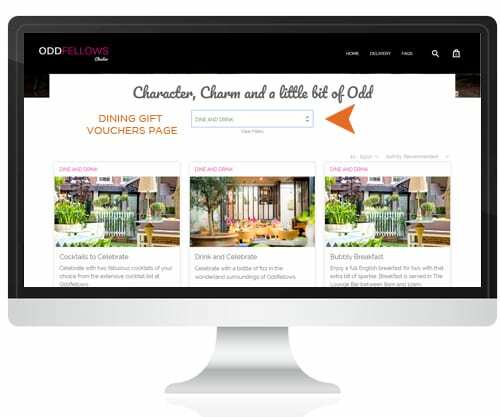 Let’s say a person browsing your venue’s website is viewing the ‘dining’ page and they then see and click onto a link for gift vouchers on that page, which then takes them to your gift experiences. From a user experience, how frustrating is it to be taken to your voucher homepage, where they will then need to perform another search for dining vouchers? And how much more intuitive and effortless would it be to be able to view dining gift experiences available, streamlining their journey – from what they were viewing on your website, to your gift site. We recommend that our clients use deep links in relevant places on their website to link to matching (filtered) search results on their gift voucher site. Making this change is easy – simply find the relevant url on your gift voucher site (for example, by selecting ‘dining’ as the filter) and then copying the url and inserting this as the link from your website. So simple! SK Chase is in the process of ground breaking transformation – to realise not only its own, but its clients’ potential – and deep linking is a ‘quick win’ – an effective way to increase conversion and sales!